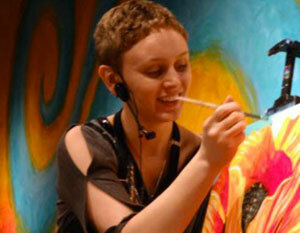 Savannah Oravetz-Harbaugh comes from a long line of Artists and Educators. Her style varies a great deal, with influences from Asian screen and fabric prints, 19th century Art Nouveau, Cubism, Pop Art, and Modern Art. These styles are incorporated in her works in a variety of mediums such as oil, ink, ceramic, wood, acrylic, and mixed media. Savannah received her degree in Art Education and minored in Psychology, with the intention of using art for its therapeutic properties. From her work with The Very Special Arts and teaching with The Painted Cork, she admires art’s ability to unlock unknown aspects of one’s personality.